Whaka Inaka : Causing Whitebait is a joint project between EOS Ecology, Ngāi Tahu, the University of Canterbury (UC), and Conservation Volunteers New Zealand. The project was designed to address anecdotal evidence suggesting that spawning has greatly declined due changes to riverbanks and riparian vegetation rendering much of the historical spawning habitat unsuitable. 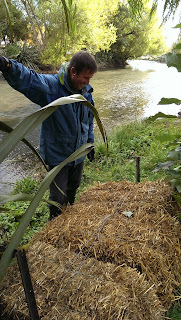 Previous UC research showed that straw bales are a perfect artificial spawning habitat for īnanga, with the small gap between bales providing excellent protection for the developing eggs. 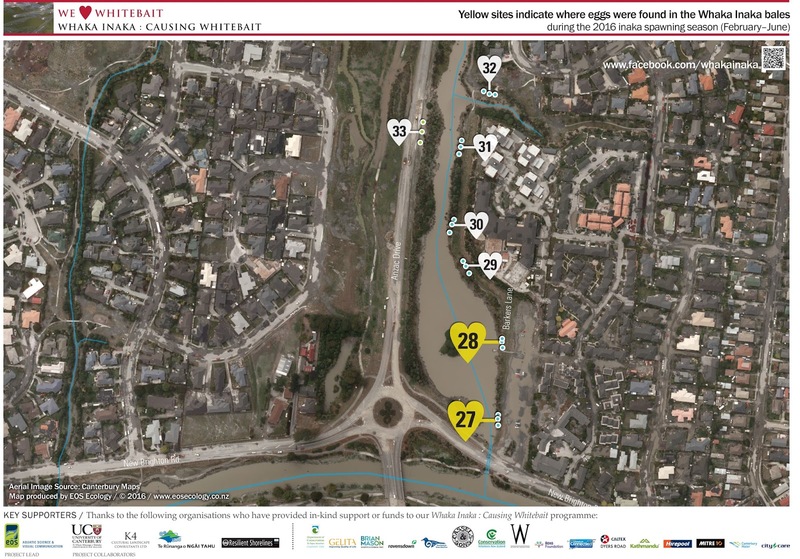 Egg densities and survival in the artificial habitats were found to be comparable to that in nearby riparian vegetation, and often higher. These studies established that that artificial spawning habitats may be useful as catalysts for the rehabilitation of natural spawning areas by providing intermediate spawning habitat while plantings or existing vegetation mature and develop . Over the 2015 spawning season the Resilient Shorelines project extended this idea by trialling the use of artificial habitats as a research tool in degraded areas. The bales were used to provide a standardised habitat unit to assist the identification of reaches that may support spawning if other environmental conditions were suitable . In 2016 the Whaka Inaka project employed this concept to create the largest-scale initiative of its kind. The locations for the installations were an experimental design based on results from the recent post-quake surveys . The design included three replicate double-bale sets per test site to provide reliable information on whether spawning could be re-started in degraded areas. The test sites covered a considerable length of the waterway margin in our two main study sites (Lake Kate Sheppard and the Heathcote/Ōpāwaho). The objectives include not only to improve spawning success over the season, but also to help determine the full extent of spawning reaches in the modified post-earthquake environment . The local community has been an integral part of the project, with direct involvement during the installation and removal phases, as well as an outreach and an education programme designed to connect the community with their natural environment. In the latest news, we've just published the science behind using artificial habitats as a research tool . Hickford, M.J.H., & Schiel, D.R. (2013). Artificial Spawning Habitats Improve Egg Production of a Declining Diadromous Fish, Galaxias maculatus (Jenyns, 1842). Restoration Ecology, 21(6), 686-694. Orchard, S., Hickford, M., & Schiel, D. (2016). 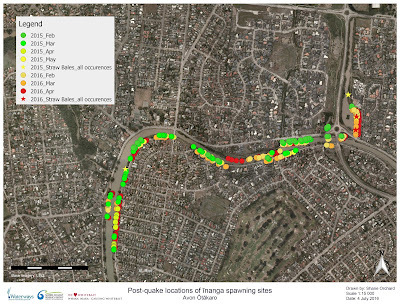 Use of artificial habitats to quantify īnanga spawning areas for conservation and management. New Zealand Freshwater Sciences Society Conference. Invercargill, New Zealand, 5-9 December, 2016. Orchard, S., & Hickford, M. (2016). Spatial effects of the Canterbury earthquakes on īnanga spawning habitat and implications for waterways management. Report prepared for IPENZ Rivers Group and Ngāi Tahu Research Centre. Waterways Centre for Freshwater Management and Marine Ecology Research Group. Christchurch: University of Canterbury. 37pp. McMurtrie, S., Brennan, K. Hickford, M., Orchard, S., & Lenihan, T.M. (2016). Whaka Inaka : Causing Whitebait – improving īnanga spawning in Christchurch’s waterways. New Zealand Freshwater Sciences Society Conference. Invercargill, New Zealand, 5-9 December, 2016. 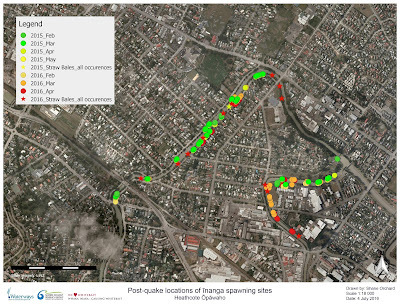 The findings from Whaka Inaka have helped identify the full extent of īnanga spawning habitat in Ōtautahi Christchurch. Check out these great maps prepared by Shelley and the team at EOS Ecology. 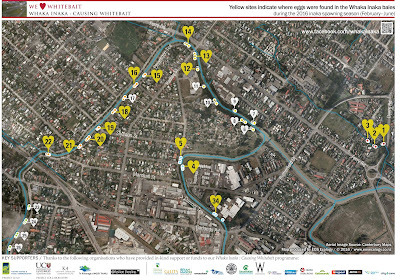 These next maps show results from two years of spawning site surveys plus two years of straw bale experiments in the waterways of Ōtautahi Christchurch. Compare them with the Whaka Inaka maps where we took all of the known sites at the end of 2015 and tested if there might be others both in the gaps and further upstream/downstream. And yes there were. There's a lot of data behind these dots! 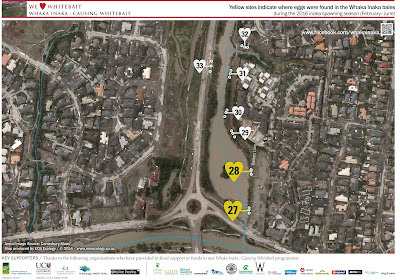 These maps are free resources from the UC Resilient Shorelines project in collaboration with Whaka Inaka. Download by right-clicking and choose 'Save As'. These sites combined equal the largest recorded area of īnanga spawning habitat in the South Island. 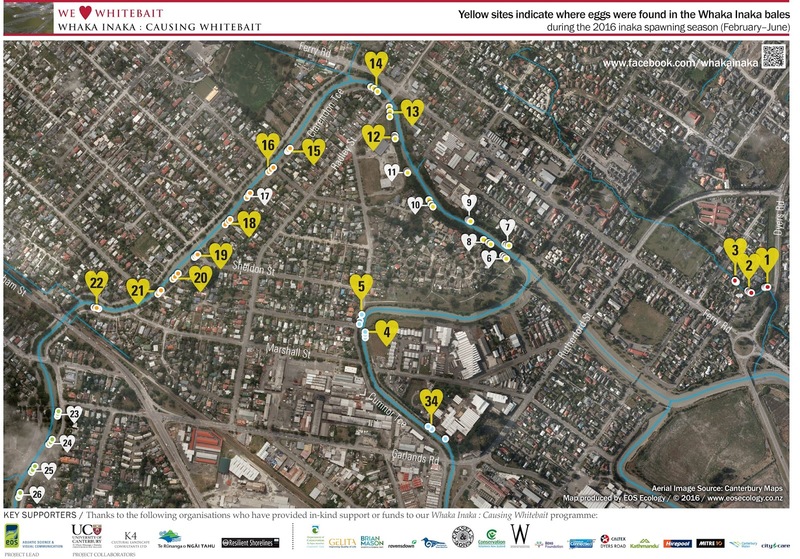 Protecting these sites and making sure the eggs make it through to hatching is a great opportunity for waterway management in Christchurch city. The Whaka Inaka project was supported by a wide range of organisations, including the Department of Conservation Community Fund, Brian Mason Trust, Avon Heathcote Estuary Ihutai Trust and local businesses such as Ravensdown. In addition there were a lot of community volunteers who helped out and got involved! Thanks to all of the sponsors and supporters who made Whaka Inaka possible.